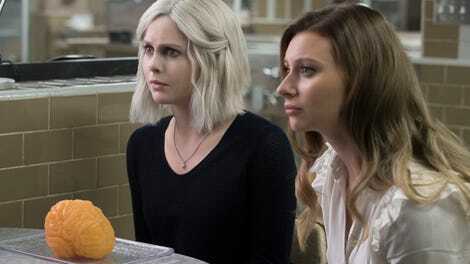 When iZombie’s fourth season began, it felt like a wide open world of story possibilities for what, up to that point, had been a show with a fairly buttoned up structure. It was essentially a full reboot of the universe, and suddenly building the world of the show beyond the immediate characters and their storylines wasn’t a fun thing to do around the edges but absolutely imperative to the narrative. It was admirable in its ambition, but the execution never quite managed to live up to the promise the ideas held. The main thing hampering the season is it feels like this was a story that needed more episodes and a much larger budget to be fully realized. iZombie has always been very good at working within its means, but those means go a lot further when you’re mostly doing a murder-of-the-week case every episode, with smaller B and C stores on the side. When suddenly everything has to stretch to include a militarized city full of zombies, complete with two separate resistance factions and a hostile outside government, then portraying the size and scope of that within 13 episodes and a limited budget gets difficult. As the season progressed and all the different factions of this new zombie city started to collide, it became more and more clear that the show just wasn’t going to be able to fully realize the promise of New Seattle and its residents it hinted at during the beginning of the season. This isn’t to say the show hasn’t been entertaining this season; it still has the same irreverence and wit that always made it special, and the cast is one of the most consistently delightful and underrated ensembles on the network. It also gave the writers a chance to stretch far beyond the previous standard of what makes an episode of the show, resulting in a few excellent outings that featured no murder case at all. Overall, however, these high points weren’t quite enough to make the entire season hang together—even if this season finale does do a fairly good job of tying all the season’s loose ends together in a mostly satisfying way. 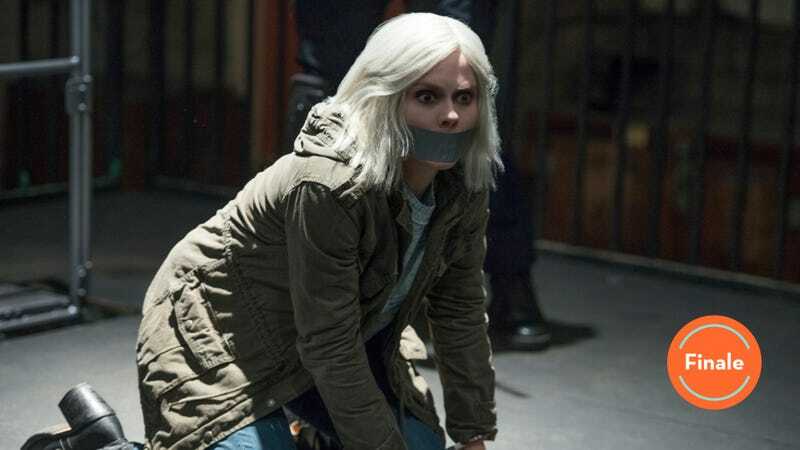 By now we know that iZombie was renewed for a fifth and final season, but if the show had been forced to go out on this episode it would have served as a fairly solid series finale. Rob Thomas appears to have been at least keeping that possibility in the back of his mind while writing the episode, considering every story and every character got their own little grace note of closure. It even ended with our protagonist getting a standing ovation, which is as good a button for Liv to go out on as there possibly could be. Even though there was never any doubt Liv would survive the episode still did a fairly good job of making her goodbye emotionally affecting, especially in her goodbye scene with Clive, Ravi, and Peyton. But of course not everyone could survive, and Levon, Chase, and Angus’ Brother Love were the season’s three big casualties. All three were fairly obvious choices to die in this episode, Levon because he’s Liv’s boyfriend (sorry Levon), and Chase and Angus because their stories had essentially boxed them into a place where their survival wouldn’t have made much sense. Chase at least got one of the more involved emotional arcs of the season for a supporting character, as he struggled with what he felt like he needed to do to keep New Seattle running and the awful nature of those very same actions. In the end, he completely succumbed to the more evil side of those impulses and was beyond being called a monster, so his death at Liv’s hands is intended to at least have some catharsis attached to it. For a moment that is sadly a bit overshadowed by the visual device of the scene, it does at least resonate enough on Liv’s face to feel like it matters. As for Angus, his story is one that didn’t quite get the attention it deserved to feel fully realized. The idea of an extreme preacher leading lost, hungry zombies into a revolution is a good one, and it was periodically put to extremely effective use at various times throughout the season. The problem with it here in the finale is that most of this revolution has to happen offscreen—including his big defeat at the hands of the army—and the result is not very dramatic. Also troubling is the way Blaine was suddenly the dutiful son who was ensnared by the affection of his father, the same father he absolutely hated in the past. There was not enough development to make that transition feel believable. But although Angus’ failure means Blaine is about to lose everything, he nevertheless lands right back on his feet like the criminal cockroach he is, now that his brain smuggling operation is the only way to get brains into the city. One day this guy will get his inevitable comeuppance, right? The person who comes out of the season with the most frustrating character arc, though, has to be Major. Major went from a guy who joined Fillmore Graves because he wanted to help, to a guy who committed more than one extremely awful act against both humans and his fellow zombies in the course of the job, to a guy who flipped sides and went against them in order to save Liv, ending the season as the replacement head of the organization with the goal of fixing all its problems. On paper this is a fairly rich arc for a character to undergo within a season, but on the screen there simply wasn’t enough development of each of these shifts to make it feel like a rounded, satisfying journey. The problem is that we never got much of a sense of Major’s internal life while he was going through all of these shifts, so almost all of the events surrounding him existed in a place where other characters were interpreting them for us. Just one or two moments where Major had an actual conversation that wasn’t a yelling match with Liv, or expressed any sort of emotion about what he was doing, might have been enough. One exciting thing moving forward is that this episode cleared so many of the stories the show was having difficulty juggling, leaving room for an almost-fresh slate for the final season. There’s still the pesky walled zombie city running out of brains problem to navigate, and the U.S. government’s obvious preference that the whole city basically disappear into the Pacific Ocean. But with Fillmore Graves in the hands of someone who seems to want to actually do the right thing, and the zombie zealots essentially wiped out, making New Seattle a city that can actually work long-term feels like an attainable story goal. Because that’s Liv’s mission, right? Humans and zombies living together, in peace. The episode’s title is a lyric from Elton John’s “Levon,” which was a pretty big hint that poor Levon would not survive the episode. I am very, very happy Ravi and Peyton’s relationship survived the season intact. This show needs at least one solid, stable couple to make it long-term, dammit. Clive and Dale’s relationship also survived the season intact, and Dale tooke the cure so she could become human again. The whole story with the cure at the end of the season was not very good, but Clive and Dale getting a happy ending out of it is a good outcome. Love all the recurring characters that showed up here, like Justin, Vampire Steve and Johnny Frost. “Is that Paul Rudd narrating?” And the existence of the documentary is justified, just for that. Cubicle drone by day, teen drama addict by night. All roads worth taking lead to Capeside, MA.